Volume 2, Edition 24 Trouble loading? View this email online. The Los Angeles Department of Public Health has awarded an $880,000 grant to CSUN dedicated to reducing obesity rates among low-income Supplemental Nutrition Assistance Program Education-eligible populations in Canoga Park. 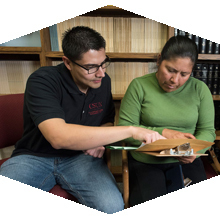 Low-income individuals and families are now able to seek free assistance with state and federal tax preparation from CSUN’s Volunteer Income Tax Assistance (VITA) Clinic and satellite locations throughout the San Fernando Valley from now until April 15. Due to the weather, we’re taking the giant pinewood derby track of the Matador Motorway indoors to the SRC, where all races will take place on Saturday during Homecoming. 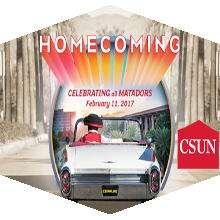 Join us for the fun, food and festivities of Homecoming. By purchasing a car, you are also giving back and supporting the MataCare Fund for students. Wed, Feb. 15. 9:30 a.m. This engaging discussion on mindset and student success is led by Yeager, a developmental psychology faculty member at the University of Texas at Austin and Fellow at the Carnegie Foundation for the Advancement of Teaching at Stanford. Nominations for Faculty Senate positions are being accepted at the Feb. 16 Faculty Senate meeting. Another option to run for an open position is to submit to the Faculty Senate Office a petition with 15 faculty signatures by 5 p.m. Friday, Feb. 24. Open for election are the posts for faculty vice president (one-year term), secretary (one-year term), CSU statewide academic senator (three-year term), senators-at-large (two-year term, six positions). For more information, contact Heidi Wolfbauer, X3263. 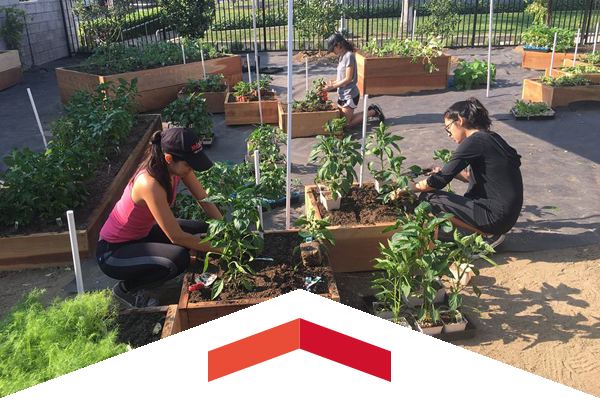 Commit To Be Fit, the free fitness program for CSUN faculty, staff, students and community members, which is led by CSUN Kinesiology students under the supervision of CSUN Kinesiology faculty, is back for the spring semester. Meeting four times per week, Monday through Thursday, participants can elect group or individualized training. The Hollywood Foreign Press Association, the organization that produces the Golden Globe Awards, specifically sought out two CSUN students to intern at the popular award show, which saw more than 20 million people tune in. All CSUN faculty and staff are invited to our special open house just for you. Light snacks and refreshments will be provided. We look forward to seeing you there, 9 to 11 a.m. Managing data and keeping it secure is the responsibility of all employees. Ensuring that access to data is granted and removed according to policy, and that proper procedures in handling data are followed, is the responsibility of managers and supervisors. Join Senior Director and Information Security Officer Kevin Krzewinski for a discussion of current policy and emerging issues.